When it comes to collaboration technology, from the classroom to the conference room, clients are looking for BYOD solutions that improve productivity and shorten project timelines. Today, AV integrators are ready to help our clients make the most of this culture shift and conquer the challenges BYOD presents organizations. As more employees and subcontractors bring their own smartphones, tablets and computers into the workplace and access company networks remotely, it’s not enough for clients to take a passive role and accept this change without having a firm plan in place. The right technology, together with proven processes and standards, allow companies and organizations of all types to make the most of this shift to BYOD and gain a competitive advantage rather than just creating an additional security risk. But without a proactive approach, effective technology deployment and a solution than is scalable over time, you may find your clients remain confined to a limited market silo. Emphasizing the advantages of BYOD, including reduced costs and increased productivity and innovation, will help guide your clients to select a technology adoption strategy that works best for their needs. BYOD compatibility increases the success of collaboration by making it easier for people to connect, exchange ideas and work on multiple platforms. In higher education, where BYOD is the norm, this digital transformation increases opportunities for integration between the physical classroom and distance learning all while integrating audio, video and complex information in a collaborative team environment. Using BYOD, students can collaborate with teachers, fellow students, researchers as well as digital resources seamlessly. When it comes to implementing a robust AV solution to enhance learning, BYOD is an essential part that also offers innovative commercial applications. With companies relying more on outsourcing, SaaS, subcontracted services and a remote work force, there is a pressing need for tools that can increase efficiency and push innovation forward from the start of a project through final implementation. As the digital marketplace becomes more dependent on cloud technology and specialization of core competencies, clients who resist adopting these collaborative tools will be more susceptible to losing market share. Rather than just dwelling on the challenges, AV integrators can help our clients embrace the possibilities of BYOD compatibility by identifying and mitigating any new risks. The collision between personal and commercial devices, work culture shifts and the need for increased security protocols has already created many challenges for CIOs, employees, and collaborators working with BYOD. The California ruling that upholds compensating workers for taking calls on their personal devices is just one reminder of the economic impact of implementing a lackluster BYOD strategy. David Willis, Chief of Mobility Research with research firm Gartner, points out that “mobile device management in the corporate world is going to be as common as antivirus was for PCs. At a certain point, you won't pass an audit” without the proper protections in place. BYOD is so frightening to some CIOs and companies that they would rather get rid of all these devices than learn to work with the technology. While the mixing of personal and company data, creating a uniform user experience across devices and the security nightmares associated with a wide range of devices connecting to a single network are all issues to address, a more pressing challenge is transforming company culture to embrace BYOD. AV integrators can help our clients understand that the risks of avoiding BYOD are far greater than those associated with adopting this evolving technology. Rather than getting bogged down with the challenges, AV integrators need help our clients overcome the issues of security, privacy and compatibility so they can benefit most from the collaborative features BYOD offer. One way your clients can mitigate the risks is to secure ISO 27001 certification and/or HIPAA compliance. These organizations offer widely recognized certifications for risk mitigation. If your clients and their providers adhere to these guidelines, they will continue to maintain much of the protection they require. 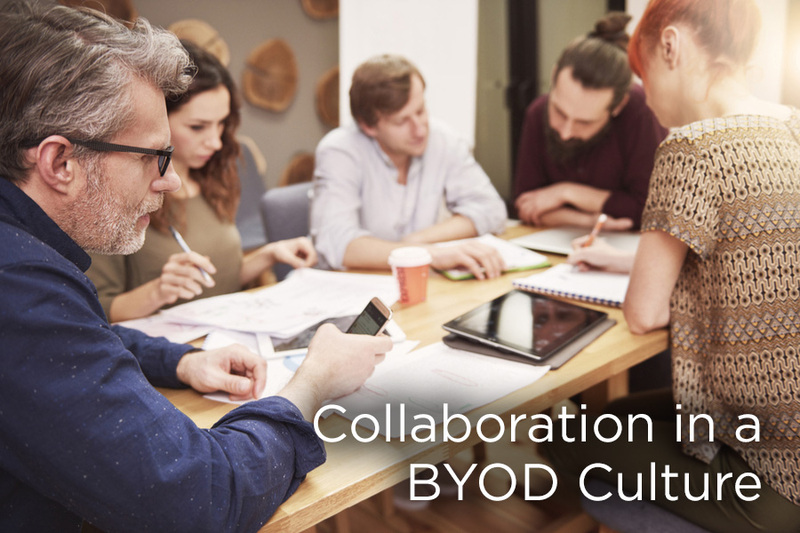 As the thought leaders at Advanced AV describe, the right technology tools can make all the difference when it comes to enabling successful BYOD collaboration. These applications allow employees, subcontractors, students, researchers and stakeholders the ability to upload digital work, collaborate virtually and communicate detailed information and ideas in a fraction of the time of traditional methods. AV integrators can help our clients couple hardware technology with programs like Adobe Spark and Google Apps to make the transition between devices as seamless as possible. As Forrester points out in Best Practices For Securing And Empowering A Mobile Workforce, enthusiasm for BYOD programs often diminish when deployments expand to include both a larger percentage of the workforce and significantly increase access to corporate apps and data. Rather than waiting for larger installations to take hold, AV integrators can help our clients push past this limitation by thinking bigger when it comes to BYOD and the advantages it offers their organizations.